The YouLess is a device to track your domestic energy consumption. 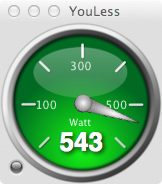 The YouLess Monitor for OS-X is an application for your Apple Mac to display your current energy consumption using a gauge meter. Besides a regular resizable “floating on top” window, it also displays the gauge in the Dock icon.